Henrik B Palm was born May 6, 1910 in St Hilaire, Minnesota, joined in the army on Jan, 31 1944 at Ft. Sheridan, Illinois, and because he had three children he was one of the oldest men to be drafted. He began his military training at Camp White, Oregon and advanced artillery training in the mud and snows of winter for weeks at a time. It is where young men are disciplined and toughened by doing their share of marching, calisthenics, KP, guard duty and yes pushups. They go through rigorous obstacle courses and crawl under live machine gun fire. They march with weapons and heavy packs on their backs while simulating battle conditions. They learn to be responsible for themselves and their buddies, follow orders and work together in their unit. Soldiers belong to Uncle Sam and this is drilled into them day and night from Reveille to Taps and often up at 3:30 am for KP and get back exhausted to quarters at 9:00 pm. The men of the 96th Division became known as Deadeyes because of one scrappy officer who insisted on marksmanship and all the weeks on firing ranges; Brigadier General Claudius Easley. Henrik was assigned to the Artillery in the 363rd Field Artillery, and learned all about the 105 and 155 cannons. It was soon time to get ready for landing their cannons and to Camp San Luis Obispo and Camp Callan, California to train. They had landings with LSTs and other simulation. The men then went to Camp Beale, California and participated in more extensive rifle training, infiltration, artillery range practice and general overseas preparation. The Deadeyes would prove in combat that they were crack troops and all this preparation was necessary. They moved to Camp Stoneman, California, where they received summer clothing and new equipment. It was July of 1944 and the time to leave the country had arrived. The Deadeyes made a nostalgic trip by truck convoy down through San Francisco where the men boarded the USS Sea Marlin. They sailed through sub-infested waters and hundreds of the men had become seasick. They arrived in Honolulu, Oahu, Hawaii and settled into up their huts at Schofield Barracks for six more rigorous weeks of jungle training, more practice landings and indoctrination. They next boarded the troop ship USS Warhawk which stopped at Eniwetok for fuel in September, sailed on past Manus Island and then made an assault landing on Leyte, an island in the central Philippines after the US Navy had shelled and softened the beaches, and Deadeye artillery units were soon ashore and pulverizing the areas ahead of infantry. Artillery men do a lot of manual work handling the shell cases and stacking etc. Firing frequently takes place at night. Cleaning is a chore. They are not front line troops but they do dig foxholes. They were harassed by Japanese snipers and Henry said one evening bullets just missed his head and ripped into a tree behind him. When a forward area is secured by infantry artillery units pack up and move forward and the men unload and stack shells, reorient their cannons and then dig new foxholes. Artillery fire is required and used to advantage at every little village and point of contact with the enemy and so was the case on Leyte. This effort required two months of intense, wet jungle warfare. Leyte was declared secure by MacArthur in December of 1944. When the battle was over, over 500 Deadeyes had lost their lives, hundreds lie wounded in hospitals, and 7,700 Japanese had been killed. Combined American forces had secured the island and had eliminated 48,790 enemy troops. This is bloody warfare, and the Deadeyes of the 96th Division had performed well. Our country had a foothold in the Philippines and used Leyte for a base to liberate all the Islands. The US Navy was involved in the greatest sea battles the world had ever endured to land and protect American forces on Leyte, and Deadeyes were not aware of them. After weeks of mopping up straggling Japanese troops Deadeyes did get to lick their wounds before preparing for the next invasion. Under the supervision of Vice Admiral Raymond Spruance and the US Navy the division was transported to do battle on Okinawa. It is here that the largest artillery barrages of WWII impacted enemy soil, and when the tally was completed after 82 days of combat on Okinawa there were over 300,000 artillery rounds fired by Deadeye units. It was comforting for infantrymen to hear those shells swim over and hear them impact enemy positions. As there were several hills and valleys on Okinawa these sounds echoed and roared repeatedly. Forward observers from artillery units were routinely stationed on the front lines to watch the results of fire and follow the orders of Infantry Officers all in support and purposes of men on the ground. Often smoke shells to cover men bringing out wounded and making withdrawals to save lives. 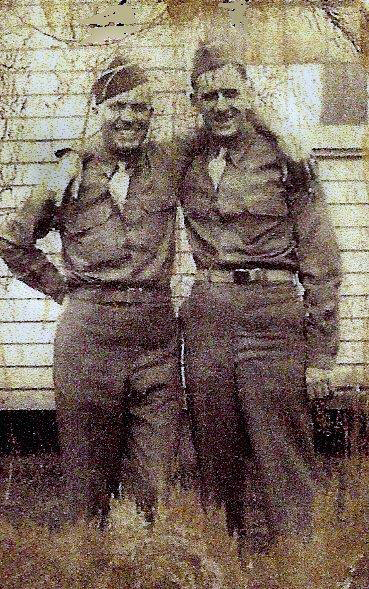 These men were often subjected to the same enemy fire as the infantrymen and responded valiantly, earning many bronze and silver stars respectively. Many of these artillery men volunteered for this and took often took turns up front. Henrik had been a Deadeye for eight months when he was interviewed by a reporter for Radio Station WJR in Detroit. This when he was in Leyte in 1944. He was asked about his job with his artillery crew and Henry made reference to the preparation of charges. He explained that the size of the charges was determined by how far away the impact area was. They referred to them as hot or cold; meaning long or close. They were proud of their credited hits and marked their cannons like the Air Force men marked their kills on the fuselage of their bombers. In the interview he made reference to the Japanese Bonsai attack of November 4, which was a period when Deadeyes killed over 1600 Japanese troops. One can hear sounds like rifle fire in the background. 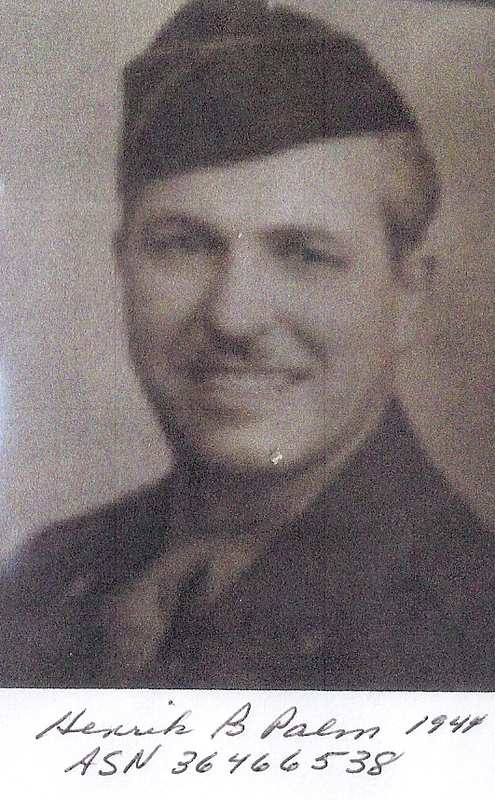 Henrik Palm was interviewed on the lines in Leyte by WRJ Detroit in 1944. This interview was made on an aluminum record by Presto Recording Corp, NY. It has been transferred here to Mp3 for Remember the Deadeyes guests. Click Here to Listen to the Recording! Henrik B Palm was born May 6, 1910 in St Hilaire, Minnesota. His parents were Stilluf Tobias Jansen Palm and Randie Olavs Sandland who were from Norway. He was one of thirty children born to his father. He graduated from high school, and had a football scholarship to St. Olaf college in South Dakota. He met and married Betty Louise Blanchard and had three children, all born in St. Paul, Minnesota. He had been a manager of a dry cleaning business. . It was told he was a policeman in Chicago and had been a reluctant runner for gangster Al Capone in Chicago, and because of his dry cleaning business he was able to carry the bootleg alcohol. He was always worried he would be recognized by the mob as a cop. His daughter remembers him telling an early story about walking along behind tanks, not paying attention and then having to run to catch up. He became a traveling salesman, to St. Petersburg and could never be cooped up in an office. He had a gentle soul, and never swore. He believed in following the golden rule. When he shook your hand it was a promise. He sold and developed his own dry cleaning chemicals under the name of "H B Palm" and "Packo." The dry cleaning business throughout the south knew him- especially because of signature - gaudy ties. Photos from "The Deadeyes, a History of the 96th Infantry"